When you deploy Processes to a Test or Production environment, Bizagi runs validations within its dependencies engine to detect objects which are being used by the Processes to be deployed. Through these validations, objects like entity attributes, forms, rules, etc., are published automatically into the target environment. Similarly, Bizagi identifies objects in the Development environment which are not being used by the Processes to be deployed. These will not be taken into the target environment by default. However, it is possible to decide manually which additional objects should be included when you deploy processes. This option is especially useful to include objects such as entity queries, which are not necessarily related to a Process itself. When you plan and launch a deployment, it is possible for technical profiles executing the deployment to detect objects that are not explicitly used by a Process; and to manually include these objects through the same option (present in a deployment's configuration). For example, when you deploy a process, you may want to specify that this deployment deploys a specific query form (or entity query) into your target environment (Test, Production). You may do so by using the Relate Object option to mark that the particular query form relates to a Process. 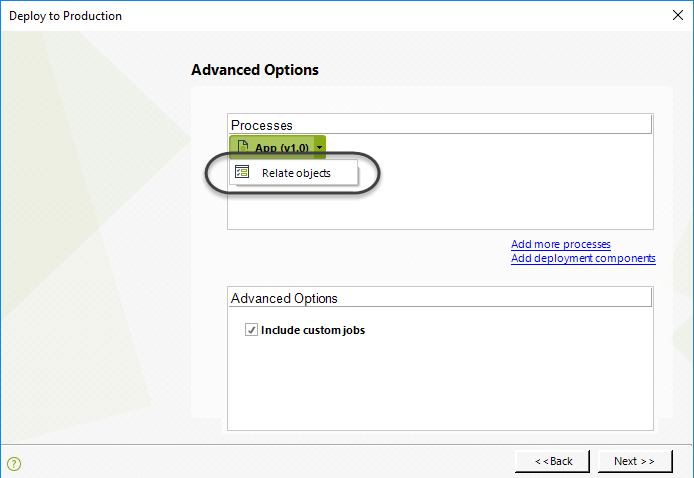 To relate objects, click the Related Objects option from the Deployment Wizard. Within the configuration window, you may relate: Attributes, Query forms, and Business Rules (including functions) or Custom jobs. Click the first Attributes tab to select the attributes of the entities (Master or Parameter type) which you want to relate to the given process. You can select the entity if you want to select all its attributes. Click the Query forms tab to select the Application or Entity level queries which you want to relate to include in the deployment. 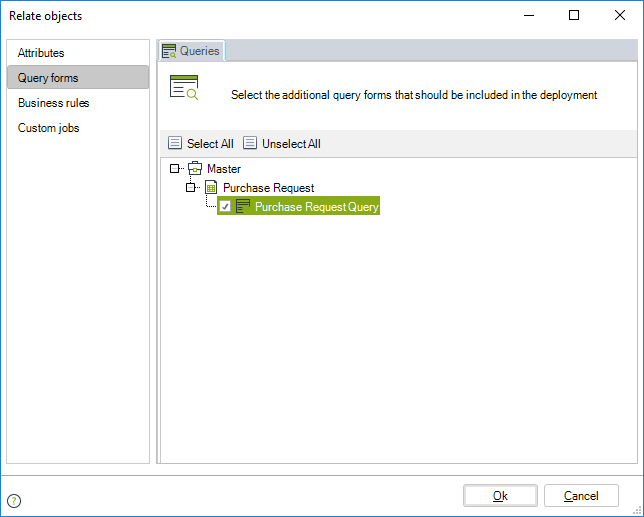 In the image above, the Entity query Purchase Request Query is marked as a related object. 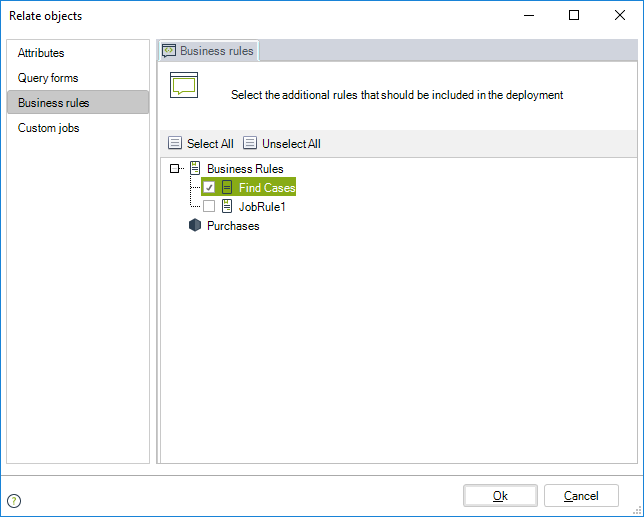 Click the Business Rules tab to select the scripting or Boolean type rules and function you want to include in the deployment. In the image above, the Business rule Find Cases (at the level of Business Rules) is selected as a related object. Bear in mind that any defined Library rule is automatically included in the deployment. Click the Custom jobs tab to check the custom jobs you want to relate to the given Process. In the image above, the Custom job called CancelCases is marked as a related object. 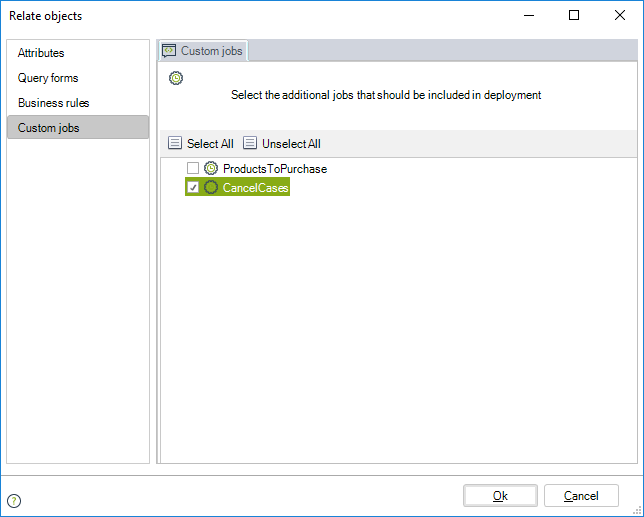 Click the Add deployment components link to display the entities whose components can be deployed. 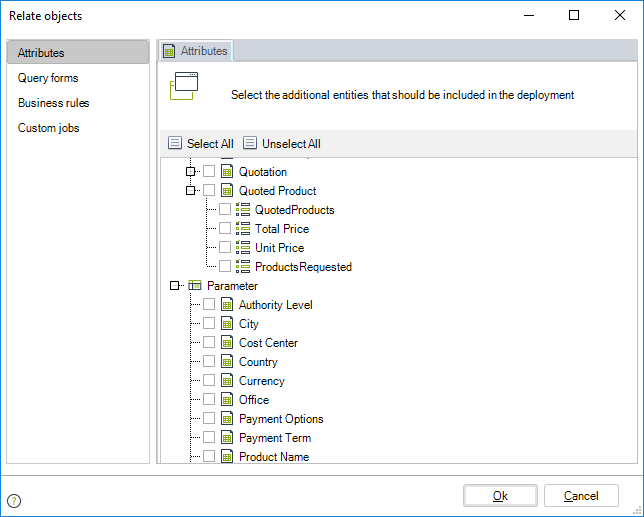 In the image below, the Entity query Customer has multiple objects eligible for deployment.